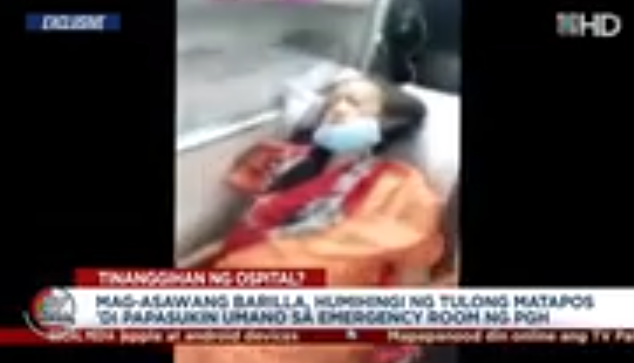 The Philippine General Hospital (PGH) will investigate an incident where their security guards refused the man to enter the emergency room with his wife, who was the patient. 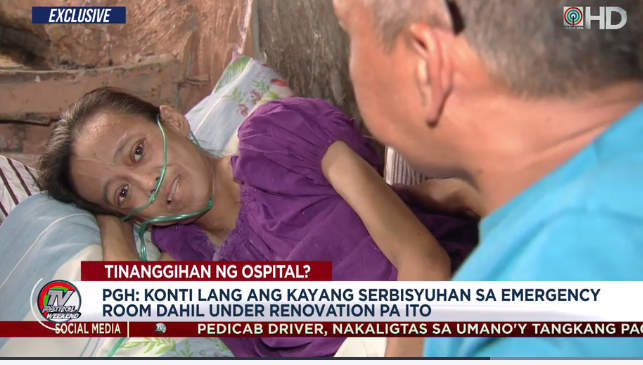 According to PGH Spokesperson Jonas Del Rosario, their emergency room can accommodate only few patients because it is currently undergoing renovation. 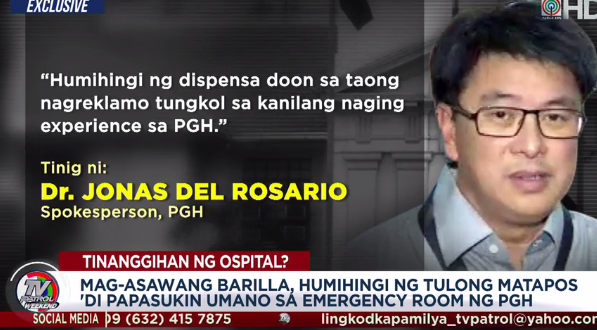 "Humihingi ng dispensa doon sa taong nagreklamo tungkol sa kanilang naging experience sa PGH," said Del Rosario. 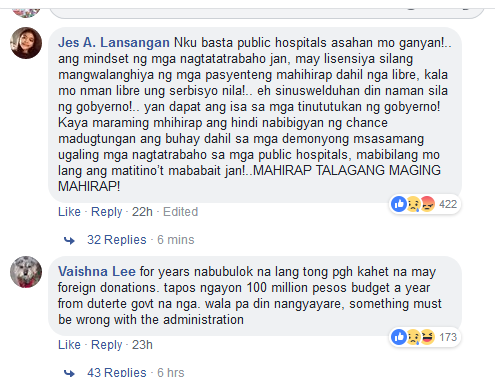 "Agaw-buhay na pasyente, 'yon lang po sana ang aming ine-entertain kaya po kami ay lagi humihingi ng apela at pag-unawa," Del Rosario added. According to the husband, Mister Randy Barilla, they went to PGH on Friday to get the oxygen needed by his wife, Lei, who had a lymphoma. But when they arrived in the hospital, they didn't allow them to go down because the hospital no longer have oxygens. Because of his anger, Randy took a video to show how the guards treated them, and posted it on social media. The guards also forced them to delete the video. "Sa pamunuan ng PGH, lalo na doon sa mga security officer, sana huwag naman kayo ganoon kagrabe," according to Randy. Lei hopes that her husband's trouble with PGH will soon be resolve. Lei also prays to be with her husband for many years and to see her favorite actress Vice Ganda personally. THIS BLOG CLAIMS NO CREDIT FOR ANY IMAGES POSTED ON THIS SITE UNLESS OTHERWISE NOTED. IMAGES ON THIS BLOG ARE COPYRIGHT TO ITS RESPECTFUL OWNERS. PHOTOS USED ARE FOR ILLUSTRATION PURPOSES ONLY. WE DO NOT OWN THE PHOTOS AND NO COPYRIGHT INFRINGEMENT IS INTENDED IF THERE IS AN IMAGE APPEARING ON THIS BLOG THAT BELONGS TO YOU AND DOES NOT WISH FOR IT APPEARS ON THIS SITE, PLEASE E-MAIL WITH A LINK TO SAID IMAGE AND IT WILL BE PROMPTLY REMOVED. (Video) Dating kasintahan Ng Groom, Sumugod sa Kasal at Nagmakaawang siya ang pakasalan!